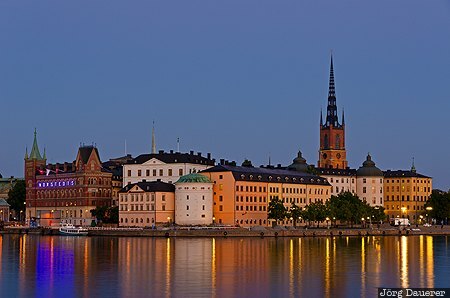 The skyline of Riddarholmen with the landmark tower of its church and its reflexions in the water of Norrström at the blue hour after sunset. Stockholm is in Stockholms län, Sweden. This photo was taken in the evening of a sunny day in September of 2014. This photo is in the Photo Calendar "Südschweden". This photo was taken with a digital camera.